Independence Day is one of the most cherished and time-honored holidays in the United States. This federal holiday is an annual celebration of American independence from the British Empire and is commonly associated with parades, picnics, carnivals, and concerts during the day – topped off with majestic fireworks displays after sunset. The firework shows are traditionally set to patriotic anthems including Yankee Doodle – a well-known American song that predates the American Revolution. We all know the tune, even if we don’t understand the lyrics. Why did Yankee Doodle go to town? Why did he call his hat “macaroni” after sticking a feather in it? And most importantly, how do such seemingly-nonsensical words play such a prominent role in our nation’s history? Before we find out why Yankee Doodle called his hat “macaroni,” we should probably back up and find out what the term “Yankee Doodle” means. What Does That Have to do with Macaroni? Today when we think of macaroni, we typically start salivating for the nostalgically-delicious childhood meal made of noodles and a cheese-like substance eaten from a box, but the macaroni in this instance refers to a fashionable man from the mid-18th century who spoke and dressed in an outlandish and epicene manner. America the Beautiful by MyFlorist. It’s all starting to come together now. When British surgeon Dr. Richard Shuckburgh penned the lyrics, he was mocking Yankees by insinuating that they were low-class simpletons who lacked masculinity – as if simply putting a feather in one’s cap would make him sophisticated and noble. That sure doesn’t sound patriotic, but the Yankees soon turned the tables by embracing the song as an anthem of defiance. Americans subsequently went a step further by adding additional verses mocking the British and shortly thereafter, the song went from being an insult to a source of national pride. That was more than 200 years ago, and the song still stands as one of our nation’s most beloved and patriotic tunes. In fact, President John F. Kennedy once bought a pony for his daughter Caroline – and called it Macaroni. If you’re heading out to celebrate Independence Day on July 4, or plan on hosting a celebration of your own – don’t forget the flowers! MyFlorist is here to help you celebrate with a bang with a beautiful bouquet of red, white, and blue flowers – perfect for the 4th of July. Give us a call or stop in today to see what’s in store for you. If you find exactly what you’d like, we’ll make it for you! Have a safe and happy 4th from your friends at MyFlorist. As the warm air is a thing of the past and the cooler days approach we try to find those things that give us comfort and happy feeling. Like PSL. But we do not have to look very far or spend a fortune to find them. why? Well for one, it is not difficult to fins small things that give use the warm and fuzzies or a small budget or for free and second, the simplest things are the ones that give the most. And we are here to guide you in the right direction. Warm/hot towel from the drier. Tell us that does not give you the warm and fuzzies. Very literally actually. Wrapping yourself with freshly washed warm codon goodness in a cool day ‘tis pretty much one of the best things in existence. while we are in the “animal” village, let us take a moment to appreciate all the happy heart palpitations we get when we see baby animals. puppies, kittens, lambs, chicks, baby monkeys actually any all animals bring us the “awwwww”s. “tis why we watch for ours videos of baby pandas on YouTube on bad days. And what do we send when someone is having a bad day? Flowers. you saw that coming, didn’t you? well, yes we are a florist and we would think that flowers will fix all ailments of the blues. But it is actually true. Flowers are certified joy bringers. there is actual certification after a grueling licensing exam that flowers must go through to be able to bring joy to people. those exams are given by tough and talented designers that go through each flower and make sure that they are worthy of you. There are usually notes that go along with the flowers and they are our #5 happy feelings bringers (yes, that is a thing). Sweet messages, love notes, feelings poured in words bring us instantaneous happiness. But they also last a long time. We often go back to old postcards or text message and emails from family, significant others, children, and friends and read them to absorb and feel the same feelings they gave us when we first received them. They are a beautiful thing. Speaking of sweet notes, how about the sweet deliciousness of chocolate? There is comfort and decadence that comes from placing a delicious piece of chocolate in your mouth and letting it melt slowly as you savor the luxurious flavors and aroma. Yup, those cocoa beans back a ton of happiness friends. While you are at it do the 10th thing that will undoubtedly make you happy, DANCE. Dance around, jump around. No one care if you do not have rhythm. If someone cares, then that person does not matter. ENJOY YOURSELF. Most importantly give to others all the things that make you happy. you find boundless happiness when you make others feel joy. That is a gift that keeps on giving. So, here we are in the final days of October, also known as Halloween Week also known as the day everyone asks “What are you going to be for Halloween?” or “Are you going to a party?” week. For a florist, this is the day we ask ourselves: How can we make beautiful flowers look scary? This holiday allows us to stretch our imagination and come up with some of the coolest creations you could ever come up with gorgeous flowers. With the help of googly eyes, tiny pumpkins, curly willows and a can of black flower paint we can turn an unassuming innocent pretty arrangement into a halloween masterpiece. You may be decorating your home with floating ghosts, spider webs, dangling skeletons and scary faced lanterns for your halloween party. But who said that you can’t class it up with a few flowers centerpieces. It’s true that halloween parties are not the kind of parties you plan to have flowers, and we are not saying you should, but there are ways to make your party different than the rest while maintaining the fun. Imagine how the Addams Family would throw a dinner party. We all know that they are the epitome of class (in a spooky way). What would their decore look like? How would they set their table? What would their centerpieces look like? This the time to have fun with your imagination and step away from the “normal” of life, so why should you limit yourself to what is the “normal” for halloween parties? So go for it, get creative, think outside of the box, call your florist! We’re armed with all kinds of fun goodies to add the BOO! in some BOOtiful flowers and the Spook in some Spooktacular arrangements. Leading from the Front, Middle or Back? Which Boss is Yours? There are many kinds of leader in the world of business. Three of those are bosses that lead from the front, from the middle or from the back. The most common leadership style bosses take is leadership from the front. This is where the success of the company is heavily dependent on the leader. He or she set’s the rule, the tone, the method. In this method of leadership, the boss guides and points the way s/he way or direction and navigates the business is going. This boss is the big brain. The one with the big ideas and the one that carries the company’s or the department’s future on the shoulders. A boss that prefer leadership from the middle recognized that s/he fills the important position of a “leader” while recognizing that the experience, knowledge and ability of others is equally important as his/her own. It’s somewhat a leadership in conjunction of others. While it’s true that the boss the image of leader, the role is somewhat distributed among the other staff. This boss is part of the worker bees. s/he gets the nectar from the flowers but also decides how much honey should be made and how much honey comb is needed while being the face of the company or department. A boss that leads from the back is out of the spotlight. This kind of boss takes the role of the supporting encouraging and empowering leader. Rather than taking the center stage s/he allows the followers shine. Unlike a boss that leads from the front, the success of the business in heavily dependent on the followers. This kind of leadership works best when the “followers” are fully knowledgeable, don’t need micromanagement or supervision and possess the sense of ownership and “leadership” in their specific tasks. The boss takes the role of advisor and has full faith in his or her subordinates. In terms of anatomy the boss is the neck in this situation. It turns the head where it wants it to look while allowing it the freedom of creativity and innovation. So which kind of leader is your boss? The pragmatic one that is shoulders by the responsibility of keeping the company successful who is the master expert who you learn from. The part of the team boss that works alongside you who shares his success or the motivator boss that nurtures your strengths and believes in your ability? Not one is better than the other boss but one is the better boss for your personality and working technique. Which boss you want to be? Which one fits your personality? Whichever kind your boss is, know s/he is doing the best “bossing” possible and deserves to be celebrated. Don’t forget to shop for flowers at MyFlorist.com! Well things are happening this season. So many birthdays and anniversaries, milestones, life changes etc. It’s almost like we are preparing for more parties and events that will come as we get closer to the end of the year, or as we like to call it the events and celebration season. So, it is important to know how and where we can celebrate and we can help. As far as “how” is concerned, the easy answer is: by making it the best day for the person you are celebrating or for yourself if you are the one you are celebrating. Make the person (or yourself) feel special. If you are planning a celebration for someone else, then find out what makes the person happy. Make it about that person. If the person is the kind that loves going out, dancing and partying then give him/her that. Even if you’d rather stay home and Netflix. You can take the person to the DC Fall Salsa and Bachata Dance Festival taking place in Crystal City this month, or you can reserve a table at JoJo’s for some good live music, good food and crowd of ALL ages. Or party it up at the many many night clubs anywhere from Adams Morgan, H Street or U Street Corridors, DuPont Circle, and Downtown DC. Have fun let loose and enjoy the fact that what you did is bringing happiness to the person you are celebrating. If the person is a foodie, then make reservation at the person’s favorite restaurant. Or a restaurant that serves his/her favorite cuisine, like Filomena’s in Georgetown for Italian, Rasika in Penn Quarter for Indian, Dumplings & Beyond in Glover Park for Chinese, The Blue Duck Tavern in the West End for American, Fogo de Chao in Downtown for Brazilian and meat lover. If shows and entertainment is what the person likes then you can catch shows at the Improv for some laughs, or head to the Folger Shakespeare Theater to watch Sense and Sensibility. And if instead of watching the show the person wants to be on the performing side then we suggest a fun evening of Karaoke at Muzette in Adams Morgan where you can rent a room for the guest of honor and friends to enjoy the night in private away from a mas of crowd or go to Wok and Roll on H street for Asian cuisine and some fun evening singing. It is all about making the person be in the spotlight, made to feel cherished and honored…You know what else makes them feel that? Yup, you guessed it…Flowers. With age comes experience, With experience comes (hopefully) wisdom. SO it behoves us to learn and soak up everything we can from the sage elderly in our lives and community. Such people are our grandparents. No, they are not good only for candy, silly gifts for Christmas and our birthdays and for us to go when our parents are being “unreasonable” with their demands and unyielding to ours. Our grandparents have lived. Anything that we could possibly go through in life, they’ve already gone through. Anything that we’ve shed tears for, any heart break, anything that prove to be difficult in life, they have lived and overcome. They know the way. they’ve been there, done that, bought the T-shirt (in some cases literally). Unless we are going through a time in our life that is brand new (no such thing), alien, unheard of and unseen before, then there is no need to re-invent the wheel. It benefits us to go to them and ask. We can learn so so so much. Some of us lack the patience to sit down and listen to the stories the elderly tell, even if it is our own beloved Nana and Pop Pop. That is very unwise. That is golden knowledge that we cannot get from anyone else that we are ignoring. Wisdom that comes from experience is above and beyond knowledge that comes from simple observation and scholarly research. Now we are not saying that you shouldn’t educate yourself other ways, but why would you pass on free wisdom that comes from a person that’s live it? You need love advise? go to your grandparents. You will learn the dos and don’ts. You need financial advise? Yup, grandparents again. They’ve lived through many many many economic climate through the past years. When planning a party or any kind of celebration, there are four elements that are a must: Food, Drinks Entertainment and Decor. And for the 4th of July celebration, when we get to celebrate the birthday of our country, it is important we do it with lots of pizzazz. It’s the country’s big day after all, so it’s a given that the theme is red, white and blue. Here are some of our fun ideas that can help you plan your celebration. BBQ is the go to. It’s hot out, you want to soak up some vitamin D, you have the day off so it’s a perfect excuse to grill al fresco. Plus it a very easy and stress free way to feed your guests that will show up with their friends and their friend’s friends and their cousins, so a lot of people. But you might want your food to follow in the patriotic theme so there are fun of ideas to help you. You can incorporate fruits and vegetables and deserts for the reds whites and blue elements. You can make some fruit salad with strawberries blueberries watermelons and bananas and throw in some mint leaves because yum. if you are baking a cake the you can decorate it and use blueberries and bananas for the stars in the American Flags and white icing and strawberries arranged in lines for the stripes. You can also make red velvet cupcakes with white buttercream icing and plop a blueberry (or three) on top. For a healthier options you can make individual frappes in clear cups and layer with ripe strawberries or raspberries yogurt and of course blueberries. We’ve decided that blueberries should be the fruit of the day! It’s hot outside so you will need to hydrate. Now, what you choose to hydrate with will depend on your age and choice of beverage. Fourth of July is usually a family holiday, so there most probably will be small children, teenagers and adults of a legal drinking age present, it’s, therefore, important that they can all enjoy themselves, responsibly. Here are some cool ideas you can use to incorporate the theme of the day into your drinks. Since it’s july and undoubtedly hot out it’s important you have ice. Ice doesn’t have to be boring cubes of just H2O. You can get creative. Cut cubes of watermelon and freeze them. YES! They are juicy watery fruit so they are perfect for freezing and they will add flavor to your drink whether it is just water or otherwise AND they will not water down your drink (if you are not drinking water of course). you can make smoothies for the younger crowd. We suggest you blend the different color fruits separately and layer them so they can show the distinct color in the glass you pour them in. If you are serving the fruity deliciousness to an adult then you can pour in some adult liquor stick in an umbrella and tiny American flag, dip your feet in the kiddie pool sit back and enjoy. If you are mixing some cocktails then here are some drinks that will add color to your drinks: the blue Gatorade which is hydrating, refreshing, delicious, and blue, Hawaiian Punch for your red, and Pina Colada mix for your whites. Well it’s a party after all, your guest have to enjoy themselves and a great way to do it is to plan games. you can buy red white and blue balloons to stay in them and play water balloons or balloon pop. Or play American history trivia, pictionary or charades (you’ve got to keep the kids brain working in the summer wink wink). Capture the flag with American flags is another good one. Baseball is after all THE American pastime, so you can’t go wrong there. Bocce is another game that is getting some serious popularity these days and a perfect outdoors game for all ages. All these are games that both the younger and older crowds can play and really enjoy. We’ve touched on some things already, like little flags for your drink and the patriotic color balloons. But there are so many different ways you can liven up your place to really add some fun to your party. Of course flowers are number one. You can contact a knowledgeable florist and they will guide you through what would look great. And by “they” we mean “we”. There aren’t very many blue flowers and a plethora of red and white ones. But there are many ways to incorporate the color while adding spark to an arrangement that would make them perfect for a party. Blue vases, blue ribbons or bows, stared confetti centerpieces and many more and be arranged together to give your party the oomph it deserves. You may think, “why would I get flowers to put outside to bake in the sun”, and you would be right to think it but remember your guests are not only outdoors. They will be congregating in your living room and your kitchen and will use your bathroom. Flowers will help you spread the festive decor you have outdoors merge seamlessly indoors and do it with class. And you get to enjoy the flowers long after the party is over, the last of the guest has been shoved out and there aren’t’ any more hot dogs left. So Bonus! We hope you have a fantastic holiday weekend celebrating the country’s birthday! Have fun and stay safe! We’ve established that flowers are the best gift for any occasion, literally any occasion. You name any occasion and reason and we can show you how flowers are appropriate for it. Weddings, bereavement, new baby, not feeling well, she broke a nail, bad hair day, the wind blew west? all reasons to send flowers. Send flowers to congratulate, communicate your sentiments, show empathy, say you care, say thank you, passive aggressively say I love you but I am too cool to say it out loud. Any reason. Any reason AT ALL! You know why? Because, as we have have said many maaaaaany times before, flowers have ability to communicate in the purest clearest way and put a smile on a person’s face and inject some happiness in someone’s day. It’s been proven in science. Would we lie to you? This is a romantic time where you remember and celebrate your union and a special milestone. It’s a big deal and should be celebrated. Traditionally, roses are the romantic go to. Specifically red roses. But there are other options. The colors of romance are shades of red, purple, pinks and gold. The deeper the color the better. They show the hot flaming smoldering passion you feel for the person. 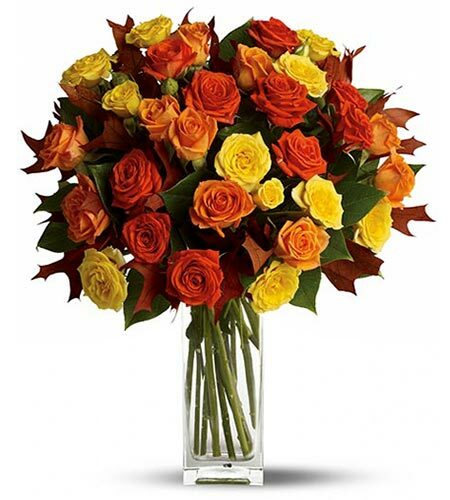 So, if you want to change it up from the red-hot roses we suggest an arrangement of various flowers in those colors. If you want to keep it in the rose family then we suggest changing the colors. You can combine the hot pinks with the red or even add some Stargazer lilies to the mix to give an extra pizzaz. You are celebrating the day this person graced the face of the earth. It is a special day and needs to be celebrated with tons of flair and sparkly happiness. and the flowers you send need to have a touch of party, a burst fireworks, a dust of glitter and a whole lot of “yay it’s your day!” in it. You can achieve that by choosing an arrangement with starburst colors of sunny yellows, royal purples, sky blues, hot pinks and other vibrant colors that adds a big ol’ ! to the day. And as a finishing touch add a pretty festive mylar balloon that will in fact announce that it is the birthday of the best human on earth! If you know the gender you can choose a color scheme to fit; blue for a boy and pink for a girl. But that isn’t necessarily a must. remember, the people enjoying the flowers are the parents and the people who will file in to take a look at the baby’s rosy cheeks. So the choice of colors you can choose have no limits. Happy yellows, lavender greens are all great choices. incorporate pretty bows and fun little keepsake containers for the flowers add a plush soft and cuddly stuffed animal and bam you got yourself a lovely fun arrangement fit for the little prince or princes and the proud parents. This is a sad occasion and traditionally the flowers sent are in soft pastels, whites and creams. However, we have to remember that is also the celebration of a life. You are permitted to include some vibrant colors. Flowers send for bereavement are either sent for the viewing/service or to the family’s home or workplace. When sending to the viewing and/or service your traditional options are easel sprays wreaths or funeral baskets. But you also have the options of choosing arrangements in an array of colors arranged in a vase or a beautiful wicker basket designed in a way that the family can take home if they choose to. we give you this option because some arrangements, when don by the right florist, are so beautiful that a lot of people want to have the in their home but don’t because they are not in a leak proof container. And how weird is it to take a funeral wreath home even if the flowers are stunning. Another option is a lush dish garden or floor plant. this is perfect because it is something the family can keep in memory of the departed. This is not an occasion to use muted colors. this an occasion for you to send a vase of sunshine and make some one feel at least marginally better. So whites and creams with mousey yellows is not what you want to go for. You want popping colors that “I know you are feeling eeky for here something to make you perky” . Go nuts with the colors! Oranges, blues, purples. reds, pinks, lilies, sunflowers, spider mums, orchids, happy gerbera daisies are all great options. Remember you are trying to lift their spirits not bore them to death. They are sick in bed, no need to add more pain with boring flowers and colors.